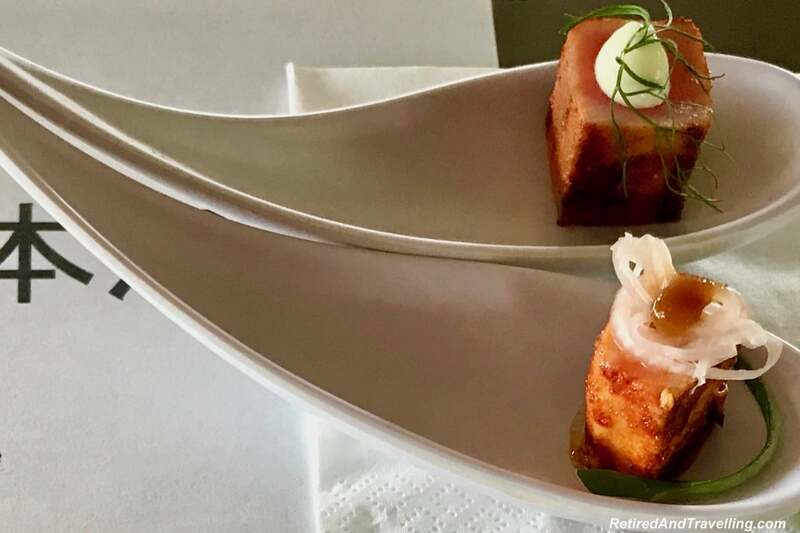 We had a busy schedule when we cruised in Japan with Windstar Cruises. We finished our visit to Hiroshima and had some time at sea. And there is always a lot to do on a cruise ship when you are at sea. We love to try food and drink activities on these lazier days. We enjoyed Italian wine tasting when we did a transatlantic cruise. On this Japan cruise, we just had to do a sake tasting at sea. 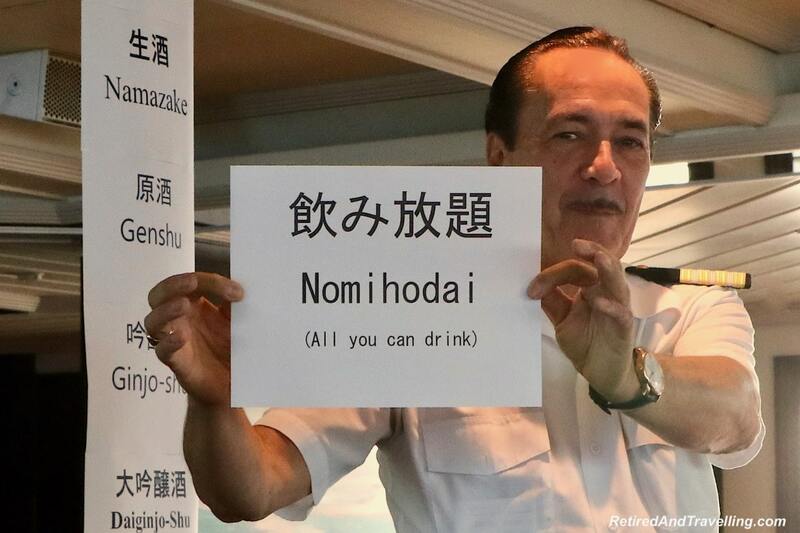 James, the GM on our Windstar Legend ship, was a big sake expert. He wanted to teach us all that he knew on this sake tasting at sea. We have had sake a few times. It was the perfect compliment to Japanese food when travelling. 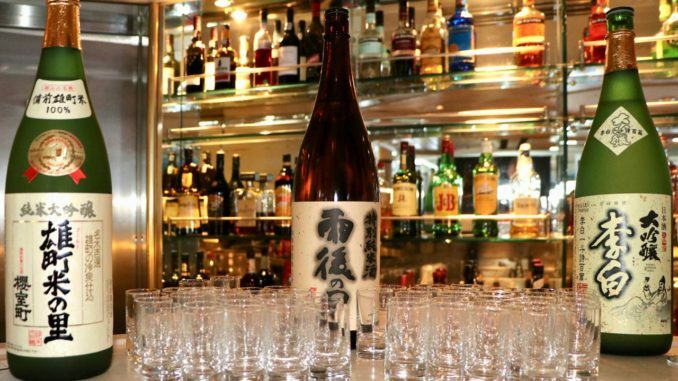 We knew from our visits to Nobu that really good sake should be served cold. But that was the extent of our sake knowledge when we started our sake tasting at sea. Sake is made by adding mold – James kept comparing it to yogurt! 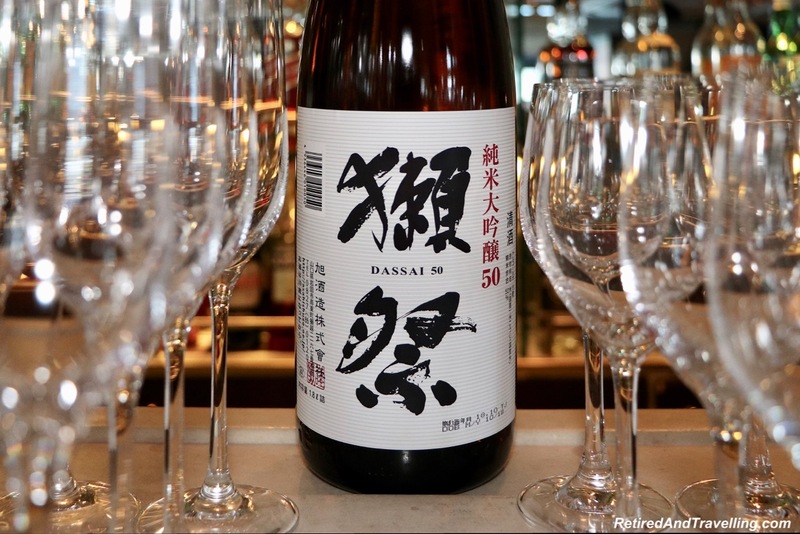 Unlike wine, you want to drink it younger and not let it age – good sake will always be less than 6 months old! 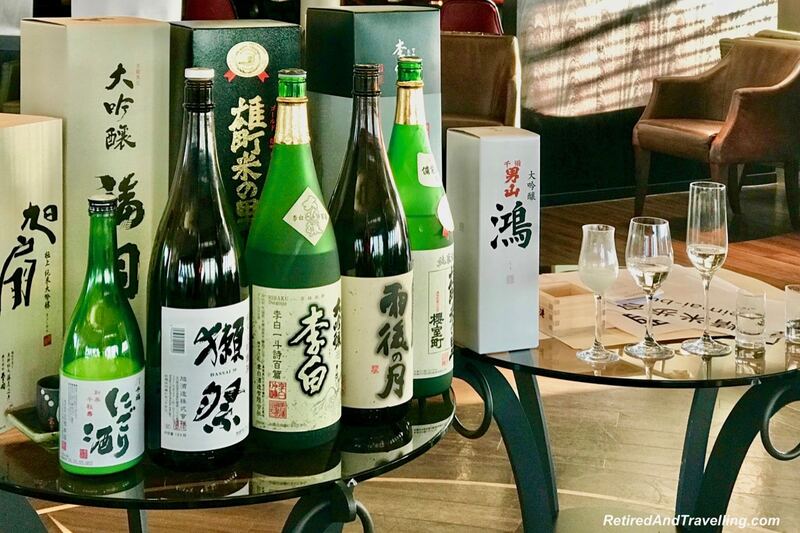 We learned all this and more when we did sake tasting at sea. 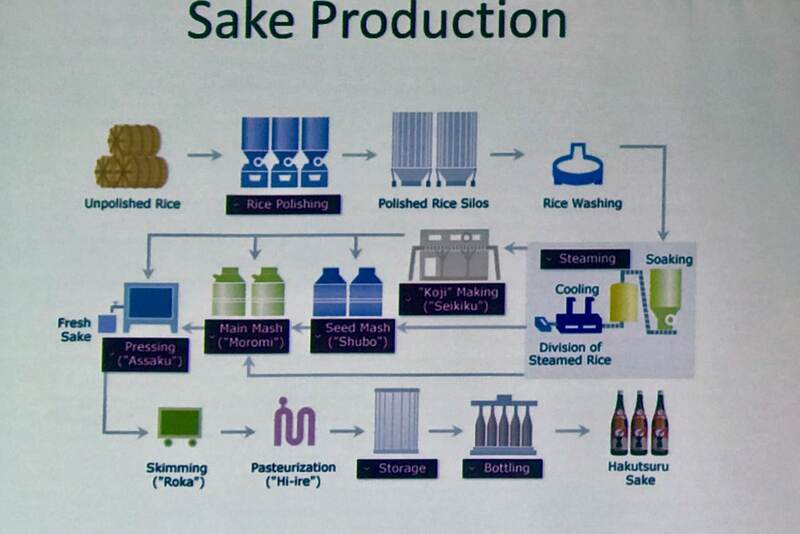 We learned a little about the process to make sake. The rice is cooked and then kept warm as yeast is added to convert the starch to sugar. Yeast is added to covert the sugar to alcohol. And then the sake is pasteurized. The flavour of sake comes from the water, mold and yeast. Most people say it is the water that makes the big difference. The other interesting thing we learned was that there are two major kinds of sake. For Junmai-shu (means “pure rice”), just rice and water is used. 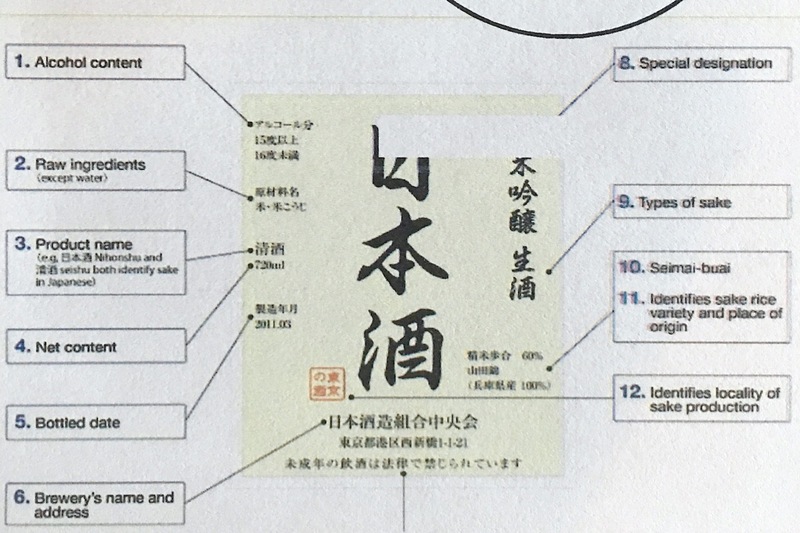 For Honjozo, alcohol (typically vodka) is added. This was started during the war when rice was scarce to stretch the production. During the production of sake, the outer shell of the rice is ground away. The more that is ground away, the finer the sake. If you want good sake, you want it at least 50% ground away. This number is shown on the label. It has been said that good sake won’t give you a hangover! The final thing we learned was that sakes labelled as “Tokobetsu” were “special”. Often this meant that flavours were added. 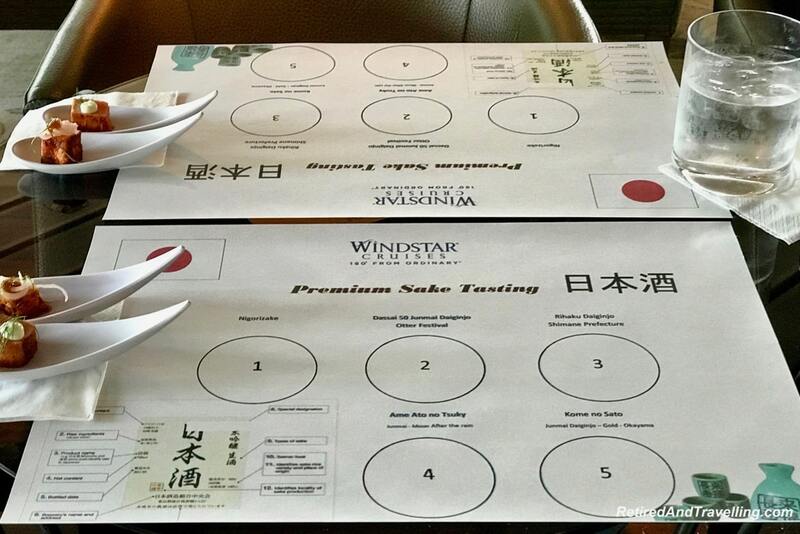 With all of this information at hand from our sake tasting at sea, we would now be able to select a great sake. I found the Honjozo versions had too strong an alcohol taste. But then, I am not much of a straight alcohol drinking in any variety. The Honjozo was a milky colour and slightly sweeter than the others. It was really fascinating to see the differences in the clarity. The sakes varied in how fruity they were. And everyone seemed to prefer a different one. We could certainly tell that the Dasai 50 had less rice shell and was far smoother. After tasting them all, I probably liked (4) the best. Maybe I was influenced by the poetic name. It was great to taste such a variety on our sake tasting at sea experience. Our place settings had two small food samples beside it. But we were not actually told to try the food with the sake. When we asked about pairings, we were told that sake paired best with the lighter foods of Japan – seafood and vegetables were best. But sake is probably not your best choice for rich foods or red meats. I was sure that the food pairings would really depend on the sake you chose. 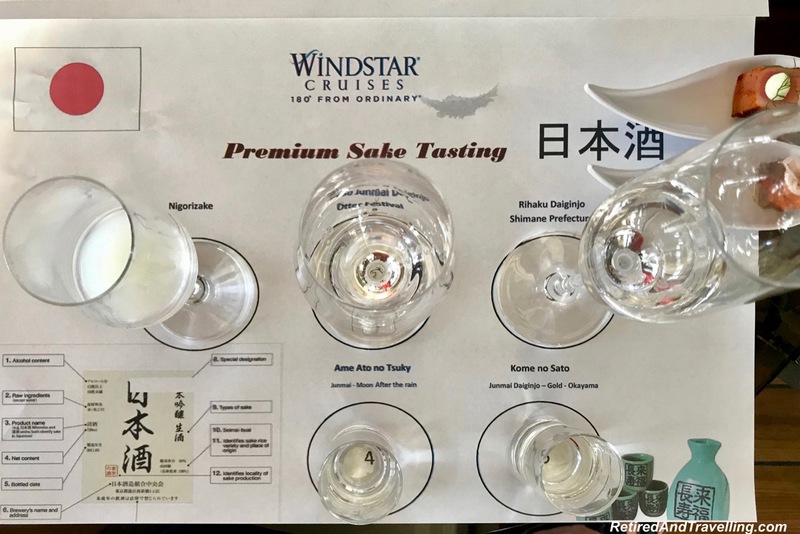 We were so glad we tried the sake tasting at sea on our Windstar cruise in Japan. It was the perfect trip to learn more about this local drink. And we learned enough to be a bit more discriminating when we next asked for sake in a restaurant. 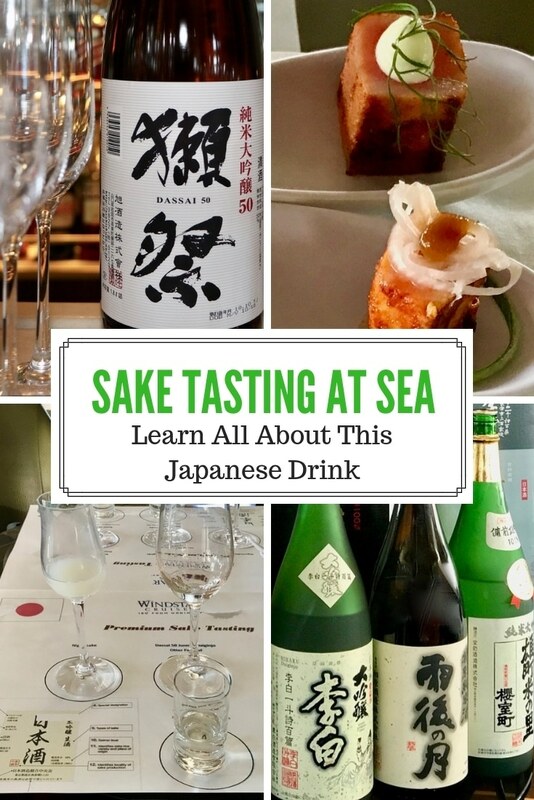 Have you tried sake tasting at sea? Did you like the sake? Very informative post about sake. I didn’t know that sake rice is grown only in Japan. Japan is my bucket list destination. This post will definitely come handy. This is definitely my kind of cruise activity! I love sake and it sounds like you learnt a lot in the tasting. Also I love the food pairing discussion. Wow! 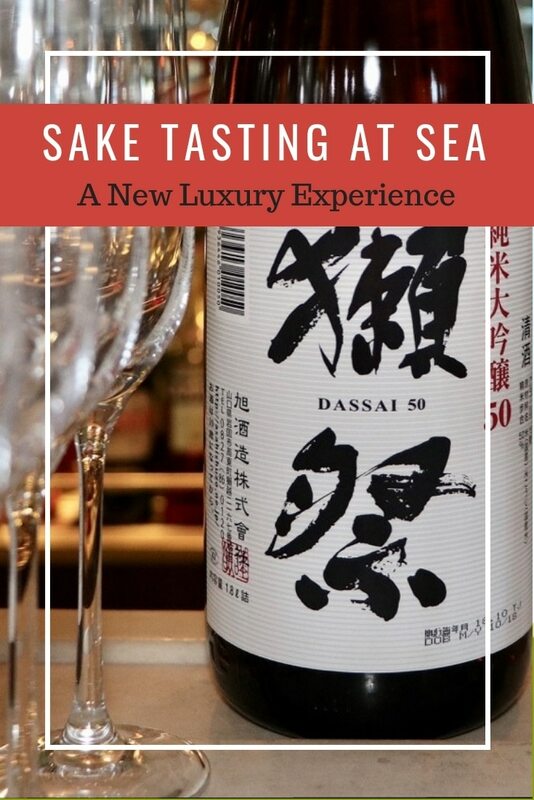 Sake tasting at sea? This is such a fun activity! Thank you for the informative post on sake. I have not done sake tasting. I think I would have liked the Dasai 50 because of its smoother taste. You mentioned you liked Ame Ato no Tsuky (4), is it sweet or fruity in flavor? Something new got to know through this post. I don’t know anything much about sake and food pairing. It is interesting to know sake paired best with the lighter foods of Japan like seafood and vegetables. Thanks for introducing Windstar Cruises and it’s nothing better than an open bar! I wonder if they have hot sake served? To me sake tastes better while served hot. That is quite an enlightening post. I did not know that sake has to be had young. Always assumed that aging makes it better. 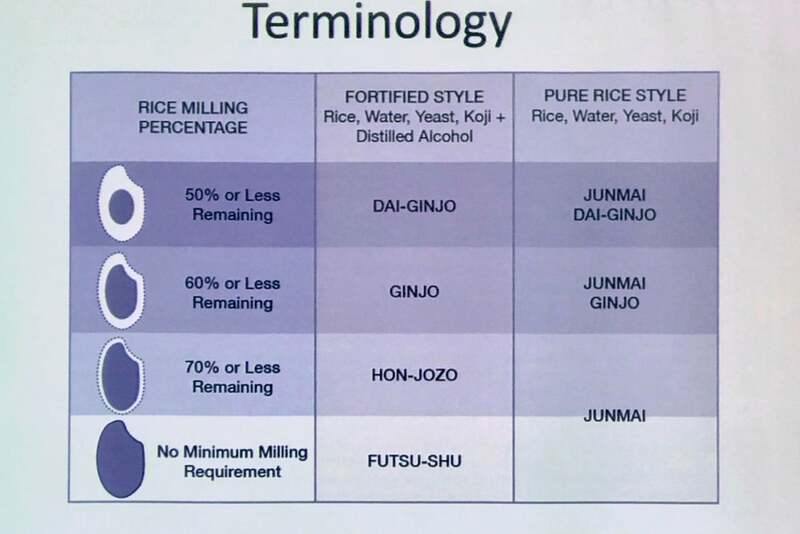 Also, interesting bit on the types of sake. While I do not have anything against sake, wine never upsets my stomach. I think I should drink more sake for my tummy to get immuned! And oh, thanks for the tip about what kind of food we should pair sake. I will keep that in mind for our next round in the office. Never knew so much about Sake. Especially the young and old and the good and bad sake. The information very well documented. Now I understand why I don’t like Sake. I was probably drinking an old one, and definitely drinking it warm. Lots of great gems of information – who knew adding mold was part of the process? Very interesting. I think I’ll give it another try- and then I’ll have to travel to Japan to get the true experience like you guys! 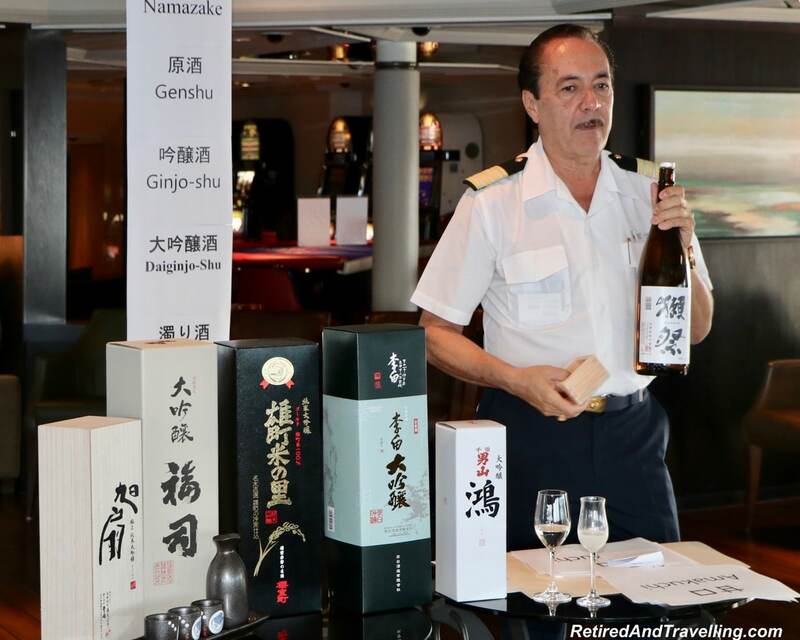 Tasting sake while on a cruise sounds wonderful! I drink sake occasionally, but I must admit I didn’t know much about it until now. For instance, I didn’t know that a good sake takes less than 6 months to age. I’ve tried the Junmai Daiginjo variety, but never tried the rest. I’m not sure whether I would like the one with added Vodka, but I’m intrigued with Ame Ato no Tsuky. I wonder what ‘Moon after the rain’ tastes like. 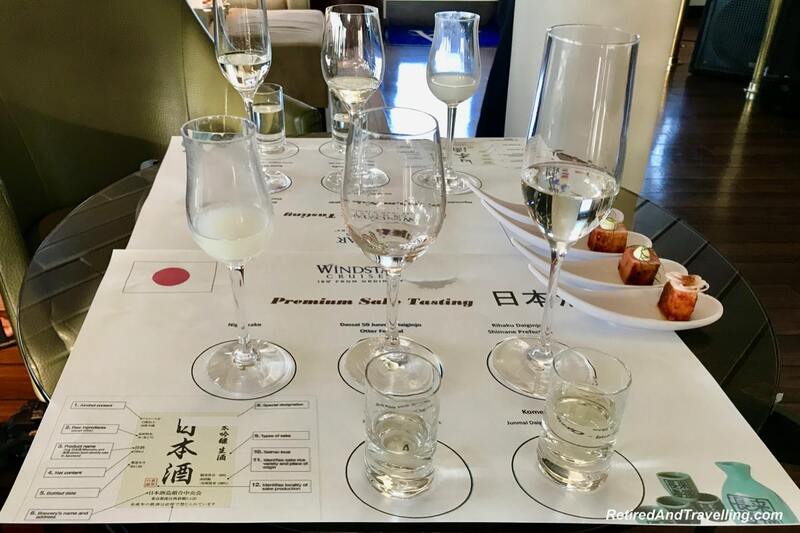 I am not a great fan of Sake, but I had an opportunity to do a testing I wouldn’t say “no.” I’m sure I would have enjoyed learning all these things about it, while testing some of the selections. Sake or yoghurt? I think Sake for the win any day. Looks like a great way to spend an afternoon on the cruise ship. Never tried sake yet! But Nomihodai would be great and fun experience if ever you remember it the following day. Thats interest to know that there’s so different kind of sake I thought it’s only the way they process brewing and adding alcohol to it, thats why they have different distinctive taste. I’ve had a few invites of getting on a cruise ship but it just didn’t happen, not because I didn’t want to, but a lot of conflict of schedules. I should really prioritize this to happen next time I get an invite. Sake plus cruising sounds legendary! I didn’t think you need to be also picky with your sake (like wine). I thought everything I had, as long as it’s in Japan, then it’s good!